The Commerce Department reported today that gross domestic product (GDP) grew at a 3.5% annual rate in the third quarter of 2009, the first sign of growth since the second quarter of 2008 and the largest growth since the third quarter of 2007. In the previous quarter, the economy contracted at a 0.7% annualized rate. GDP is the total market value of goods and services produced in the U.S. economy, and it is generally considered the most comprehensive measure of economic activity. Much of the growth in this latest quarter can be attributed to the effects of the American Recovery and Reinvestment Act (ARRA), which estimates suggest added between 2.5% and 3.0% to the annualized growth rate for the quarter. A simple sign of ARRA’s success is that in the six-month period preceding ARRA spending, the economy was contracting at a 5.9% rate. In the six months since significant ARRA outlays began, the economy has grown at a 1.4% rate. The largest contribution to the quarter’s growth rate came from personal consumption expenditures, which rose at a 3.4% rate, following a 0.9% decline in the previous quarter. About 40% of the growth in consumer spending was on motor vehicles and parts, a clear sign that the Cash-for-Clunkers program pushed up car sales markedly in the quarter. 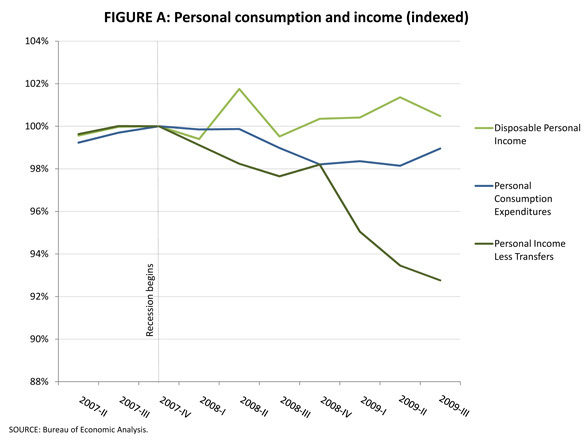 Since the recession began, consumer spending has fallen by 1.0%. Given the damage done to personal balance sheets from the bursting housing bubble, it is perhaps surprising that consumer spending did not fall even further. A clue for why this spending held up as well as it did can be found by comparing data on personal income minus transfers (a rough proxy for spending power generated by the private sector of the economy) and disposable personal income (which includes the effect of taxes and transfers on household purchasing power). This comparison reveals a boost to household incomes resulting from the reduction in taxes and greater transfers over the course of the recession, both of which were driven in large part by ARRA’s passage. Figure A below shows that personal income minus transfers has fallen much further than either of the other two series. In short, without the stabilizing effect of reduced tax collections and greater government transfers, it is easy to imagine consumer spending plunging much farther than it has. Given this evidence that consumer spending is buoyed largely by public spending and relief, it is encouraging to note that private investment rose by 11.5%. Most notably, residential investment rose at a 23.4% rate in the third quarter, its first gain since the last quarter of 2005. Less encouraging, however, was the continued decline in non-residential construction, which fell at a 9.0% rate, the 5th straight quarter of decline. Both exports and imports grew in the third quarter, at 14.7% and 16.4% rates, respectively. This ends four straight quarters of decline for exports and seven straight quarters of decline for imports. However, the faster rise of imports means that trade flows subtracted 0.5% from growth in the quarter, only the second time that trade has dragged on GDP growth since the first quarter of 2007. Perhaps the most troubling indicator in the report is the decline in state and local government spending, which fell at a 1.1% rate. This spending has fallen in the three of the last four quarters, even with the fiscal relief provided to states by the ARRA. State and local governments still face historic budget shortfalls in coming years, and without further federal aid, this large sector will be a drag on economic growth for a long time. Inflation remains extremely modest. The year-over-year change in the “market-based” price index for personal consumption expenditures (a closely watched measure of inflationary pressures) was only 1.7%. Today’s release is very encouraging about the efficacy of the Recovery Act. It seems clear now that it did what it was designed to do – reverse the downward spiral and push the economy back toward growth. Today’s release, however, is not necessarily encouraging about the long-term health of the economy. There is little evidence that the balance sheets of households and firms have yet to be repaired from the damage done by the bursting housing bubble. Until that happens, private spending alone cannot be relied upon to provide enough economic growth to create robust job-growth and bring down the unemployment rate. The recovery act has so far provide the needed spending to stabilize the economy. However, even more help in the form of public relief and investments is needed to create jobs in the next couple of years while private households and businesses are made whole and begin spending again. See also EPI Issue Brief #265, How we know the recovery package is helping.